At Advanced Basement Systems, we have the drainage solution you need to create dry, usable space in your basement or crawl space. We have specialized basement drain systems that we customize for your unique problem -- no matter what that problem may be. Our drainage systems come with a written transferable lifetime warranty. On most projects, our installation crews can install a complete perimeter drain and sump pump system in less than two days. 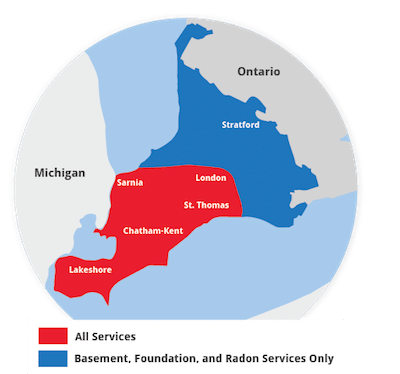 For a free, no-obligation basement waterproofing consultation and quote in Chatham, London, Sarnia, Windsor or nearby, call us at 1-844-320-1542 or e-mail us today! Each of our drainage systems is designed to address a different, unique, challenge that you may be facing. Some of these challenges involve the way your home has been designed, while others address unusual basement water issues, and past products that may have been installed like drain tile for example. No matter how your house was constructed or what kinds of problems you're facing, our waterproofing products can be combined to create a wet basement repair solution that's ideal for you! The Basement Systems line of drainage products has been used in warrantied systems for hundreds of thousands of homes worldwide! To learn more about how our system can work for you, contact us by phone or e-mail today for a free basement waterproofing quote! We offer all our basement waterproofing services in Stratford, Windsor , Leamington, St Thomas, Amherstburg, Strathroy, Essex and other nearby areas like Ingersoll, Kingsville, Aylmer, Goderich, Hanover, Listowel.